House-moving involves prying a house from its foundation and transporting the building to another location on rollers. It used to be a common, not especially noteworthy event in Wilmette. Moving houses was still a common occurrence into the 1950s. 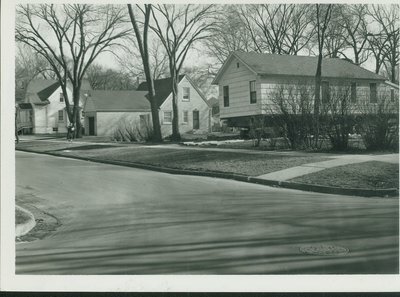 A 1948 photograph in the library’s local history database shows a house that was relocated to 738 10th St., and used as the school superintendent’s office. The photograph annotation mentions that the house was razed when Central School expanded. One move was apparently enough. There is another version of the above photograph showing a house prepared for a move in the history website. The photograph is dated 1950, and is identified only as being at Prairie Ave. and Central. Look closely to see the trailer under the house. Sadly, there is no indication whether the house is coming or going.